We present to your attention our new development – Comparison Microscope. It is designed to simultaneously observe two objects and compare their images in one field of view. Application developed by specialists of Altami company and aimed at solving tasks of control of video and image capture devices, as well as analyzing and processing the received frames, is successfully applied in microscopy. Altami Studio and Altami VideoKit applications at first were developed as applications for work with a microscope, and some time later were successfully applied as separate software for work with digital photo, video, and webcameras, as well as for correcting videos and photos, both already saved and in real time mode. Comparison microscope equipped with special software became one of the important developments of company specialists in microscopy sphere. Comparison microscope is designed for simultaneous monitoring of two objects and comparing them in one range of vision. Transmitting the image into the screen as well as the possibility of the digital processing of images, both automatic and semi-automatic, makes comparative image analysis convenient and excludes the possibility of the human factor mistake, as it is very difficult to conduct the analysis of two objects consecutively without using special software. The equipment in question is needed in different areas of research, for example, in metallography, biology, and many others. In this case comparison microscope was used by forensic experts who investigate pieces of evidence. For example, confiscated money and securities can be assessed by experts, also, bullets, pieces of cloth, different fibres, etc., can also be assessed. The microscope complex consists of two independent stereo microscopes connected with a special optic construction, two digital video cameras installed on each microscope, and PC with a certain software framework. A visual binocular capping allows to simultaneously monitor both of the examined objects in one range, in which there is a dividing line (digital splitter) for the user convenience. It can be moved either up to receiving the united field, or to the part where two fields overlap. Altami Studio Crim application is developed software for conducting comparative analysis of objects. 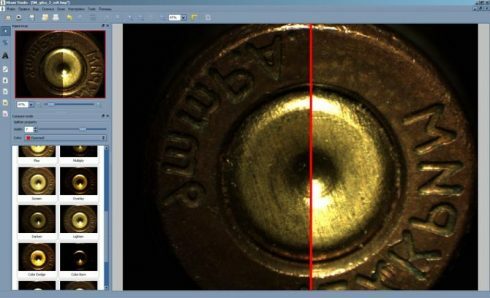 It is possible to compare objects not only with the help of moving digital splitter: the application is developed on the basis of Altami Studio and allows to conduct overlapping of images of the monitored objects and make calibration in order to define real sizes of objects in question. Measurements are possible both on active images in real time mode and on the saved images. Besides, many operations on images processing (for work with colour and form of the received images) are developed in the application. It is possible to save the results in different popular graphic formats.